Dispatched, from the UK, within 48 hours of ordering. Though second-hand, the book is still in very good shape. Minimal signs of usage may include very minor creasing on the cover or on the spine. Grubby book may have mild dirt or some staining, mostly on the edges of pages. Acceptable. Used-Acceptable. Crack in binding. Ships from UK in 48 hours or less (usually same day). Your purchase helps support the African Children's Educational Trust (A-CET). Ex-library with wear and barcode page may have been removed. 100% money back guarantee. We are a world class secondhand bookstore based in Hertfordshire, United Kingdom and specialize in high quality textbooks across an enormous variety of subjects. We aim to provide a vast range of textbooks, rare and collectible books at a great price. Through our work with A-CET we have helped give hundreds of young people in Africa the vital chance to get an education. We provide a 100% money back guarantee and are dedicated to providing our customers with the highest standards of service in the bookselling industry. Very Good. 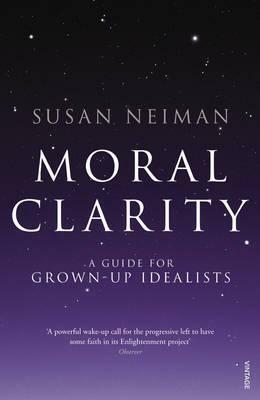 Moral Clarity: A Guide for Grown-up Idealists by Neiman, Susan, 2008-05-05. Sewn binding. Cloth over boards. With dust jacket. 467 p.
Good. Moral Clarity: A Guide for Grown-up Idealists by Neiman, Susan. Sewn binding. Cloth over boards. With dust jacket. 467 p.